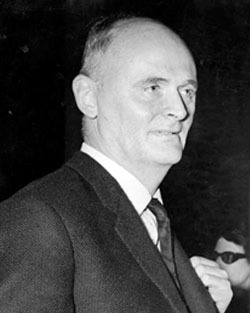 Terence Reese was England's greatest bridge player and writer. He won the 1955 Bermuda Bowl world championship as well as 4 European titles and 20 national events. His writing career included innumerable newspaper columns and 90 books. The 1948 classic "Reese on Play" is still in print today. Following graduation in 1935, Reese began working at Harrods. However, the job only lasted a year before Reese decided to pursue bridge full time. He became an assistant editor at the Bridge Bridge World and wrote his first book, The Elements of Contract, in 1938. Regardless of any personality difference, Reese and Schapiro were one of the best pairs in the game for the two ensuing decades. They won the European championships 4 times in 1948, 1949, 1954, and 1963. They also prevailed in the 1955 Bermuda Bowl against the United States with teammates Leslie Dodds, Kenneth Konstam, Adam Meredith and Jordanis Pavlides. Schapiro once wagered a fellow player that Reese would ignore a naked woman at the bridge table due to his absolute concentration. When the opportunity arose for Reese to declare a hand, a naked woman was duly summoned to take Schapiro's seat as dummy. Afterward, Schapiro asked if Reese noticed anything unusual. Reese's reply: "Yes - the delicate situation in hearts." Another anecdote involving the two occurred at Schapiro's home. Reese once stopped by to pick up a sizable collection of bridge trophies. After leaving, however, he was questioned by a policeman suspicious of a character hauling away silver trophies in a sack. Reese demanded that the policeman validate his identity with Schapiro, who responded, "Who is this person? I have never seen him before in my life." Reese purportedly spent the rest of the day in jail and was predictably displeased. Reese was a large contributor to the popularity of Acol bidding. Increasingly annoyed with the rise of artificial bidding methods, he created a facetious bidding system called "The Little Major" in 1962. Every 1-level bid was fake: 1 showed hearts, 1 showed spades, and so on. Reese gradually appreciated the actual benefits of the system and began developing it seriously. Although Reese and Schapiro continued playing together during this time, Schapiro was not fond of the Little Major system, so Reese played it with Jeremy Flint in the 1965 Bermuda Bowl in Buenos Aires. Regrettably, Reese was the cause for a huge scandal in Buenos Aires. The American team accused Reese and Schapiro of cheating. Dorothy Hayden Truscott and B. Jay Becker alleged that the pair used finger signals to communicate heart suit length. The World Bridge Federation, the governing body of the tournament, found Reese and Schapiro guilty as charged. They were forced to forfeit their Bermuda Bowl matches and refrain from WBF events for three years. It was only in 1968 that the WBF conducted a lengthy inquiry and decided that there was insufficient evidence for a guilty verdict. Reese and Schapiro were reinstated in the WBF, but were barred from playing together. The scandal prompted two books to be written. Reese penned his own account, "Story of an Accusation", that detailed every hand he played with Schapiro and the lack of evidence of any impropriety. Bridge writer Alan Truscott (who eventually married Dorothy Hayden Truscott) also wrote a book entitled "The Great Bridge Scandal", which arrived at different conclusions altogether. Reese married in 1970 at the age of 57. He ultimately retired from playing competitive bridge but continued his writing career. Like many bridge experts, he was also fond of backgammon, chess and poker. He pursued these activities until his eventual passing on January 29, 1996 in Hove, England. 1 The Independent. Terence Reese: Obituary. February 1, 1996. 2 The Telegraph. Boris Schapiro. December 3, 2002. 3, 4 Reese, Terence. Story of an Accusation. 1966. 5 Reese, Terence. Reese on Play. 1948.